I'm not one to hide veggies in dishes as a way to trick my kids into eating them, but if I can cram as many veggies as possible into a dish, then more power to me! I've seen several variations of pasta with avocado sauce, but for whatever reason, it never really appealed to me. As much as I love avocado, the idea of it mixed with hot pasta just wasn't appetizing - but as it turns out, I'm wrong sometimes, and it was pretty awesome! You start by sautéing some onion and garlic in some olive oil, add the spinach and let it wilt, then add chopped avocado and Greek yogurt. Give it a whir through the blender, and you have a beautifully hued, wonderfully creamy, and healthy pasta sauce. Apparently I am incapable of making dinner these days without adding roasted cherry tomatoes, so I topped the dish with some of nature's candy, and of course it was a great addition. Preheat the oven to 375 degrees. On a rimmed baking sheet, toss the tomatoes with olive oil, salt, and sugar. Roast 20-25 minutes, tossing once. Meanwhile, cook the pasta according to the package directions, and save about 1/2 cup of the cooking water for the sauce. As the noodles cook, sauté the onion in a large skillet until softened, 5-6 minutes. Add the garlic and cook until fragrant. Stir in the spinach, a few handfuls at a time, cover the pan, reduce heat to medium-low, and cook until all the spinach is wilted, about 5 minutes. Stir in the yogurt, avocado, and 2-3 tablespoons of the reserving pasta water. Using an immersion blender, puree the mixture until smooth, adding more pasta water as needed to thin out the sauce. Alternatively, transfer to a blender or food processor and puree until smooth. Stir in the basil and Pecorino, and add the noodles to the sauce, tossing well to coat. Divide the pasta among plates, top each serving with a handful of roasted tomatoes, and a sprinkling of Pecorino. I love avocado in pretty much any way, so I can't imagine pasta would be any different. Yum! Gorgeous! 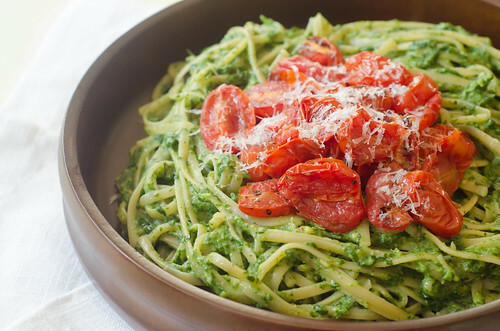 The green of the noodles and avocado look gorgeous against the red tomatoes. It also sounds amazing. This sounds great! Can't wait to try it out. It looks delish...I love pine nuts and those would be a great addition to it. I'm making this. The colors here are so bright and beautiful. I know I'd love this dish! That does look perfect for summer. 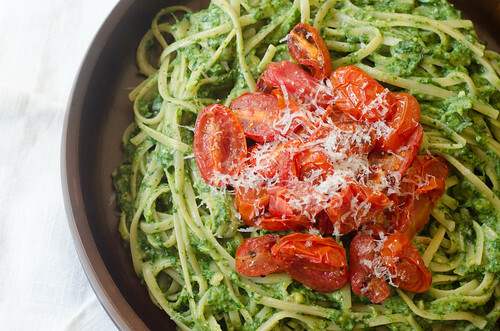 I'm excited to see green pasta that isn't just covered in pesto--although I'm not going to say no to the pesto either! Did you have any leftovers? I'm wondering if the sauce would turn gray if you tried to save the uneaten portion. I was pretty shocked at how much I loved the avocado sauce also...but it's just SO GOOD. and roasted tomatoes make everything better! OMG...I'm totally making this pasta tomorrow! Looks and sounds delicious! When I was a child, the only time I ever cried at the dinner table was when my parents made "green spaghetti." (Pesto, maybe?) I bawled for hours at the thought of taking even one bite. Now I can't get enough pesto. This "green spaghetti" looks great, too! Oh my gosh what an adorable thing Caroline said :) purple pasta = beets? Can't figure out something for yellow pasta, though! It actually stayed green and pretty! I'm not totally sure, but maybe the acidity of the Greek yogurt kept the avocado from browning? This pasta sounds so delicious! Can't wait to try it myself! This sounds delicious, and pretty simple! I'm making this tonight! I'll let you know how it goes.